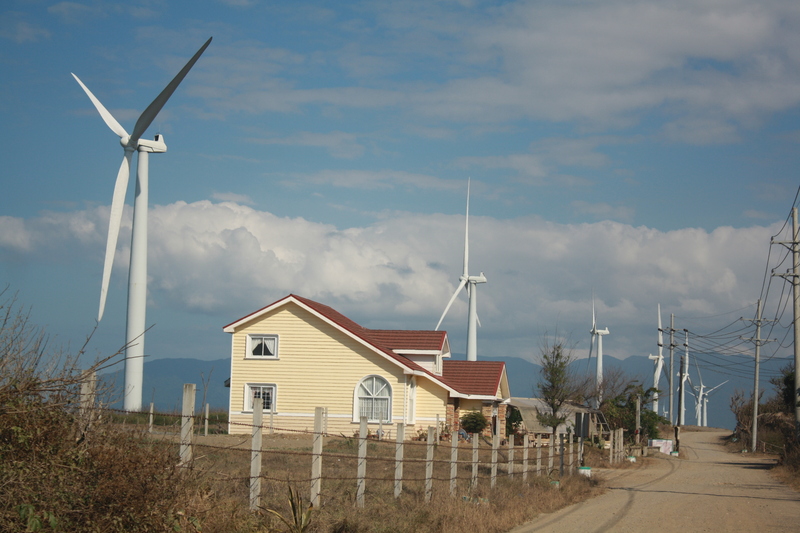 The Bangui Wind Mills – also referred to as the NorthWind Bangui Project, is located in the Municipality of Bangui in the Province of Ilocos Norte. The wind farm project started with an aid grant of $48 million dollars from the Danish Government to Ilocos Norte Province in 1998. Initially this was for 19 very large turbines spaced 236 meters apart. There are now 49 turbines to date. Current electrical power production is around 25 megawatts and contributes nearly 40% of the provinces electrical power. 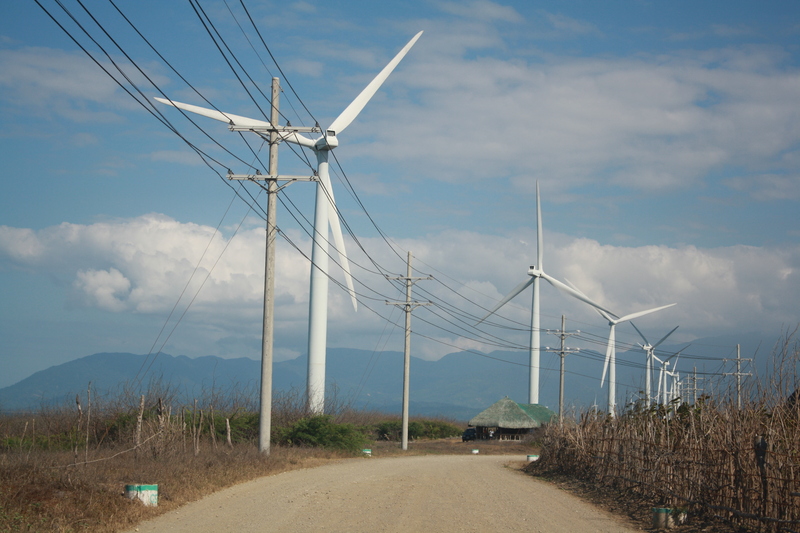 The wind farm is recognized as the largest in Southeast Asia and sells power Ilocos Norte Electric Cooperative (INEC). The expected life span of the wind generation equipment is 21 years. The Northwind Bangui Bay Project estimates that 56,788 tons of CO2e (tons of carbon dioxide equivalent) of greenhouse gases will be reduced per year for the duration of the project activity. That’s 1.2 million tons of CO2! The turbines have three vertically oriented rotor blades on top of a 50 metre high tubular tower. The nacelle (or casing), which encloses the generator, the gear box and the yaw mechanism (which turns the blades into the wind), is at the rear of the rotor blades. Each wind turbine has a 6-meter diameter base. WHY VISIT THE WINDMILLS OF BANGUI? 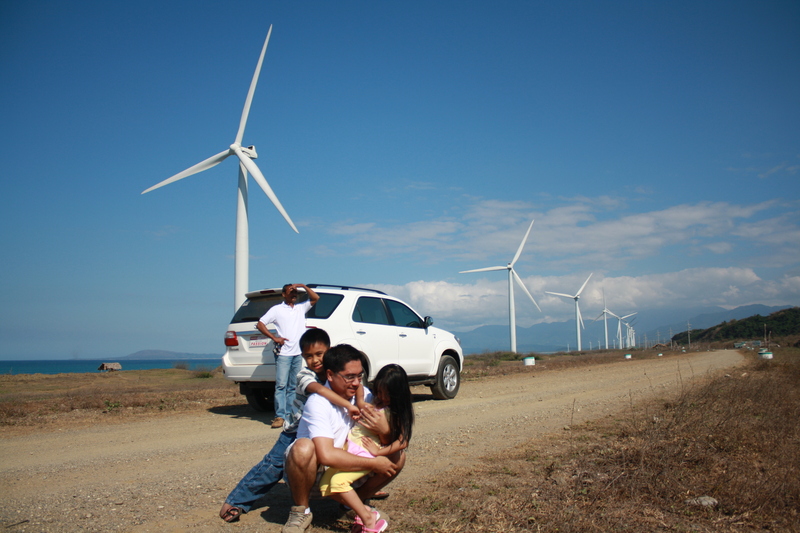 Your visit to Ilocos would not be complete without your visit here, ergo, photo with the giant turbines. First, it’s the only one we have up north. Second, it is very scenic and truly beautiful place. Third, you seem transported to another country when you are here. Fourth, it is free visiting these turbines. Fifth, don’t you just love it? The best way is through private vehicle. If you are staying in Laoag, hire a motorcycle (if you are a solo traveler like me) that will bring you here and the other tourist spots in the area. Commuting is not recommended unless you want to hike from the highway going to the windmills under the heat of the sun. 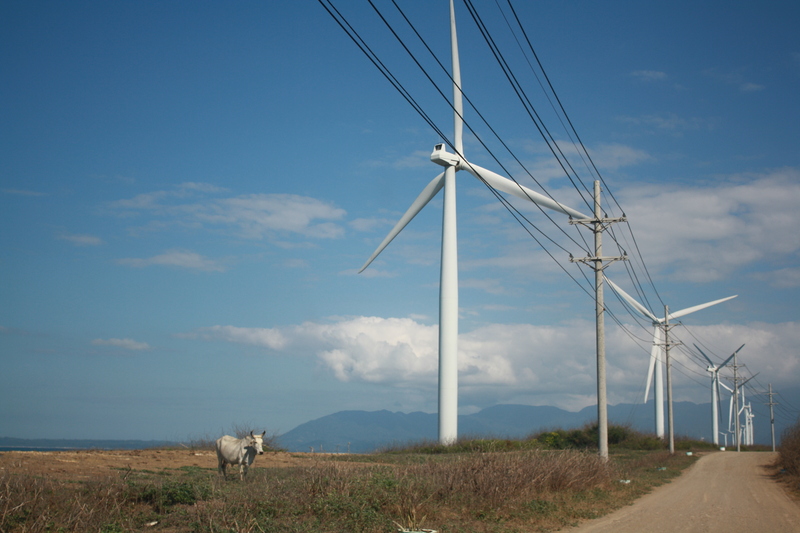 I have heard from ‘people’ that the Windmills do not really help solve electricity problem in Ilocos. Ilocos Norte Electric Cooperative still rely much on hydro-power plants. I’ve been wanting to see this scenery. It looks like a foreign. One day I’d be able to land my feet there and savor the exquisite view. What a joke that they are going to give Molokai 1.5 2.0 million doarlls for the lease of the land and the wind!! Find out how much $ they will make and I am sure we are in the range of 100 s of million $ for the energy for ohaua alone per year do not let these manipulative high business out for their own profit change you for small $. This is exactly how Hawaii got bought out in the first place as Hawaiians are seen as ignorant to be taken advantage of do not let history repeat itself. OR WE ARE DONE. This I have to see for myself. The windmills are really scenic and of course, along the way there are other attractions I have yet to visit. I love bangui windmills and I love ilocos norte in general. I can still remember the day when I was lost in ilocos norte. Looking at your pictures of the windmills makes me feel nostalgic. Would love to go back and check them out again. its nice being lost isn’t it? That beach with windmills must be the windiest place I have ever been to in the Philippines. That is also the place where the windmills are most picturesque. I’ve seen so many scenic photos with these windmills. Re: tsismis you mentioned. I hope its not true. I visited a friend’s house and they also have a small windmill which is enough to power two houses. However, since they use appliances like ref they still have an electric line from the local power company. Still almost 75% of their electricity need is powered by their windmill. Mark Twain~ Go and surprise the whole country by doing something right. I love the long travel to the Ilocos region. You will never get tired. You should visit Ilocos Sur, too and try Vigan’s empanada. JM Modomo, lets do the road trip this summer! Been here last feb and I want to go back. Awesome blog sir!